Dry eye, irritated eyes, eye strain, burning eyes, red eye, contact lens discomfort, computer vision syndrome, computer eye irritation, allergy eyes, post-LASIK discomfort and MORE. Moisture is WATER! Dry eye, eye strain, red eye, can occur when the ocular tear film's all-important aqueous (water) layer lacks sufficient moisture. Nature's Tears EyeMist is the ONLY eye-care product that penetrates the tear film with a diffusion of pure, pH-balanced, all-natural moisture directly to the aqueous layer. 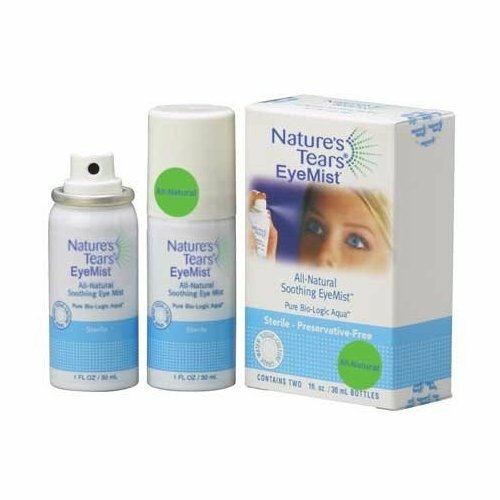 * EYE MIST® - The ONLY all-natural alternative for: Dry eye disease, computer vision syndrome, red eye, burning eyes, itching eyes, eye allergies, eye fatigue, eye irritation from perspiration, tear film dehydration and tear film moisture loss. * MISTing directions and demonstration - DISCOVER THE ALTERNATIVE TO EYEDROPS!